Pascale Massey looks upfield. The junior forward scored two goals in Northwestern’s win over Maryland. 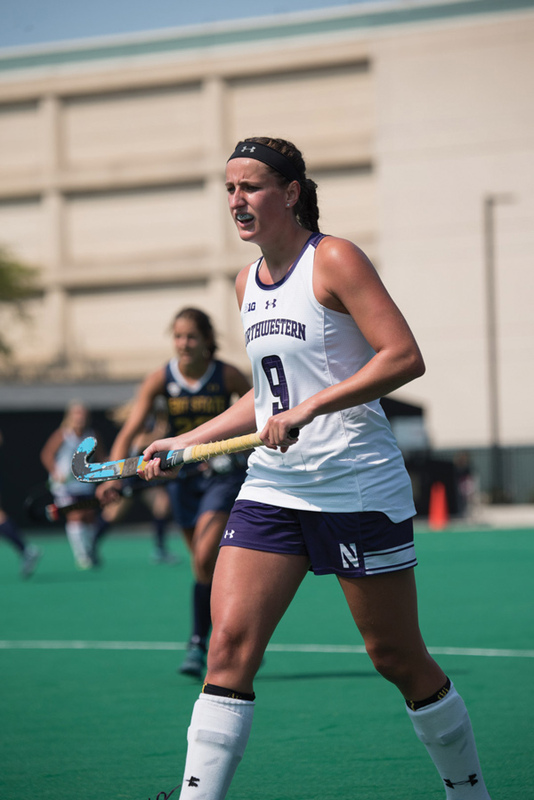 Northwestern took its talents eastward on the weekend and split a pair of hyper-competitive games against top-10 teams, losing to No. 3 Penn State on Friday before taking down No. 10 Maryland on Sunday afternoon. The Wildcats (7-4, 2-1 Big Ten) sit tied for third in Big Ten standings after the weekend along with the Nittany Lions (8-2, 2-1) and the Terrapins (6-4, 2-1). NU jumped out to an early lead Sunday, with junior forward Pascale Massey scoring on a penalty corner less than three minutes into the match. That lead proved to be tenuous, as Maryland controlled possession for the majority of the half and eventually scored to even the contest before the half. Maryland still managed to get the better of the Cats to start the second half, scoring three minutes into the period to take a 2-1 lead. That goal, however, would be the Terrapins’ last. NU struck back 10 minutes later, with Massey picking up her second goal off a corner in the game. Five minutes later, sophomore defender Kirsten Mansfield was the hero, punching home a pass from junior midfielder Puck Pentenga off another corner to give the Cats a 3-2 lead that they’d hold onto to secure the victory. NU was celebrating a dramatic victory Sunday, but it was on the opposite end of Friday’s game against Penn State. The Nittany Lions jumped out to a 1-0 lead in the first five minutes, but the Cats answered at the end of the half with a goal by Pentenga. Penn State reclaimed its lead early in the second half, however, and when they added another goal to make it 3-1 with 25 minutes left the game looked out of reach for NU. The Cats instead staged an improbable comeback with goals from junior midfielder Eva van Agt and Massey evening the score at 3-3. This time, however, NU allowed a backbreaking goal just two minutes from the end of the half, as Penn State’s star junior forward Moira Putsch scored off a corner to dash the Cats’ hopes. The NU offense once again ran through Pentenga and Massey over the weekend. Pentenga recorded a goal and two assists this weekend, while Massey scored three of the Cats’ six goals. The two are central to NU’s strategy on penalty corners, and their skill helped the Cats convert three of their seven corner opportunities against Maryland.